United Way of Union County ---- Care United is a Success! The United Way of Union County held its annual Community Care Day “Care United” on Wednesday. The project focused event brought together nearly 225 volunteers from around Union County. Events at St. John’s Lutheran School included meal packing, a food pantry drive and a project for United Way’s annual school supply drive. Close to 44,000 total meals were packed through the Outreach Meal Packing Program which will be distributed to The Salvation Army food pantry network including Plain City, Milford Center, Marysville and Richwood. 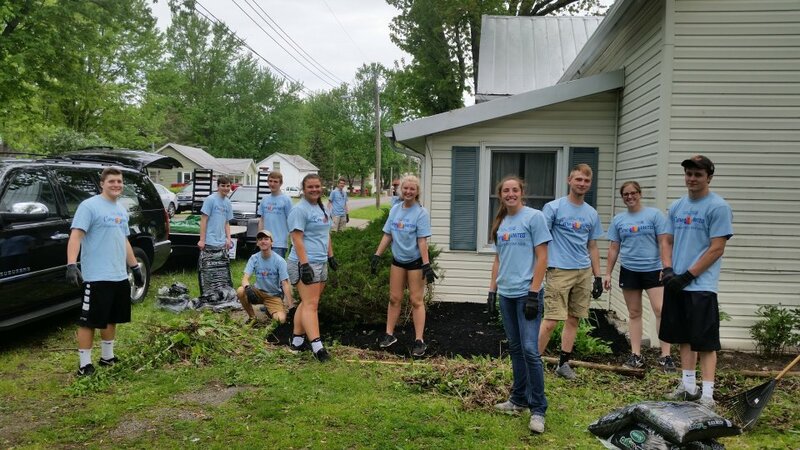 Other events around the county included mulching at Partner’s Park, the painting of the second Born Learning Trail at Eljer Park, mulching, landscaping and trash pick-up countywide at Allen Township Park and throughout Richwood. Two separate groups baked cookies for the American Red Cross blood mobile and for the military to be included in care packages. Volunteers also traveled to Discovery Riders Therapeutic Riding Center to help with spring cleanup and stable painting. Union County Senior volunteers conducted home safety checks and installation of home safety devices through the SLIPS program. The Champion sponsor of this year’s Care United Event was Jerome Village. Associate Sponsors included: Interim HealthCare; Memorial Health, Honda of American Manufacturing and Honda Federal Credit Union. Additional sponsors are as follows: Union County Foundation; Liberty National Bank; Union Rural Electric, Midwest Express; Parrott Implement; Alan Wilson CPA; Nestle Research; St. John’s Lutheran Church and School; VFW Post 3320; LeCrone Communications; Good as Gold; GKM Tobin; Techknowlogic; Walmart and Home Depot.